posted Jul 25, 2011, 6:35 AM by Becca K.
...all of the practices are making this mommy tired. I dropped Natalie off for practice yesterday. I had on cute wedge sandals. 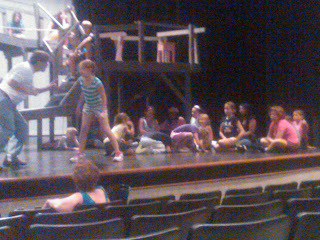 I ended up staying and becoming an orphan/street urchin stage mother for the afternoon. All the children were dressed in their orphan rags, lined up, had their props, and were on stage in time. Then all the children had to come back and change into their pick-pocket clothes. It is not an easy task to commandeer all of those kids, and their clothes, and keep them quiet, and stop the running around, and "stop touching her," "I don't know where your shoes are," "keep your hands to yourself." And finally I had to use my best drill sergeant voice, "I want you all to SIT. DOWN. NOW." "Thank you." They are really a great group of kids, but the hours are getting longer, and their time on stage is diminishing (less practicing and more running the whole show through). And they are getting cabin (hallway) fever. And my feet hurt. The show is Friday night! I look on stage at Natalie and I forget how young she is. I was worried about how she would do with the play. She is as tall as some 10 year olds, but at 7 and a half she’s got the attention span of a 7 and a half year old. And then I see her get into the scene. She watches the action, she’s into it, and then she’s no longer a 7 and a half year old. She’s no longer “Natalie the liver transplant patient.” She’s no longer “Natalie the girl with the blocked portal vein.” No more is she, “Natalie, the girl that used to have a tubey,” or “Natalie, the girl that needs to go in for a scope this summer.” She’s a pick-pocket! And I could not be more proud! Here she is playing leap-frog (in purple). Go to www.bctmagic.com for your tickets!